Voices for Women, a student organization that provides support for women and their allies, raised approximately $1,700 during their recent menstrual security drive. This money will help provide menstrual products, such as pads, tampons, and menstrual cups, to underprivileged people in the Central Florida area. The drive—the fourth at Rollins—sought to raise awareness about the lack of menstrual justice in Central Florida. A good solution, Cursey explained, is that people should have free and convenient access to their desired products during their time of the month. This is something that is out of their control and they should be able to focus on more important parts of their day. Proceeds from the menstrual security drive go to organizations such as the Harbor House of Central Florida, a domestic abuse center that provides housing and support services to survivors of domestic abuse. Money will also be shared with the Pace Center for Girls, which provides at-risk young girls and women opportunities for better futures through education, support, and advocacy. 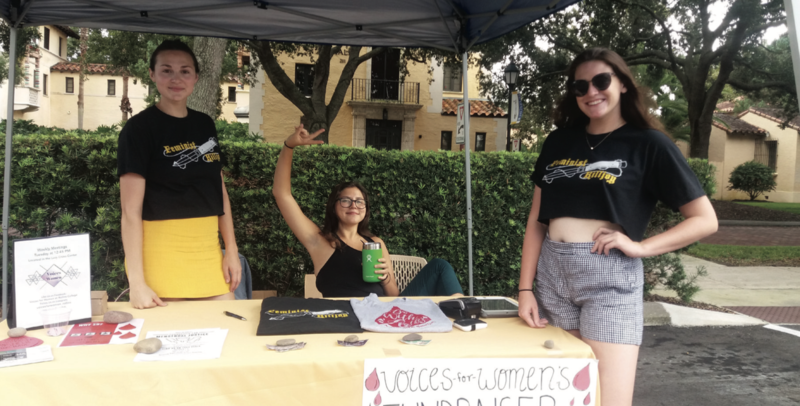 Voices for Women will “also be making goodie bags full of menstruation supplies to give to homeless people who may not be able to afford them,” said Hannah Gonzalez (‘20), co-president for events at Voices for Women. Furthermore, the money raised will be used to pay for menstrual cups, which when used properly can last for up to 10 years; however, they can cost up to $30. After sending out emails to multiple menstrual cup providers, Helmick secured a partnership with myEverCup. They agreed to provide menstrual cups to the Harbor House at the considerably reduced price of $3. Since menstrual products are seen as luxury items, Florida used to apply a luxury tax on the purchase of menstrual items like pads and tampons, whereas items like condoms and viagra were never taxed. In 2017, legislation passed to end that taxation. “This was a great step in the right direction but only a small chip,” said Helmick. Helmick, who developed a deep passion for menstrual advocacy, has spent much of her college career working on research, and she has also published articles in The Independent about menstrual justice. This coming December, Helmick will travel to India to share her research, and she will also be teaching a class at the Harbor House on the proper use of menstrual cups. Since menstruation is such a stigmatized subject in society, people usually do not donate menstrual products, and the government does not supply them to housing facilities or place them in public bathrooms. “There’s a big lack in menstrual education all over,” said Helmick. Because so many do not know about the struggle that those who menstruate face every month, it is difficult to supply them with their needs. The goal of the menstrual security drive was to raise $900, as this was their first monetary drive, having previously taken donations of menstrual products; so the members of Voices for Women were overjoyed with their fundraising success this semester and hope the movement continues to garner interest.